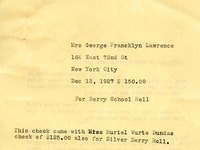 The document is a list of names and addresses with monetary amounts entitled "Berry Silver Roll". 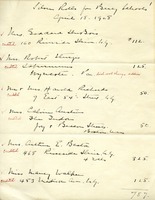 The amounts are totaled to $446 at the bottom of the list. 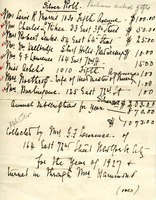 Margaret Myers sends $121.00 that she collected for the Silver Roll. She says she continues to distribute literature about the Berry Schools around Princeton. 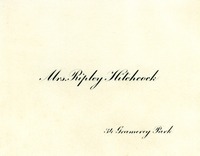 Mrs Hitchcock sends a $750 silver roll donation in memory of Mrs Henry Marquam by her friends who were Pilgrims with her at Berry. 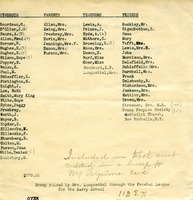 Hammond provides a list of those going on the April 16 Pilgrimage and encloses contributions to her silver roll. She is sailing the next night on the Mauretania and looks forward to seeing her daughter Alice. 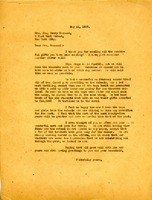 Martha Berry writes to Mr. Cutting to thank him for the gift that he gave for the Silver Endowment fund. Mrs Lawrence donates $150 for the Berry School Roll and a check for $125 for Silver Berry Roll. 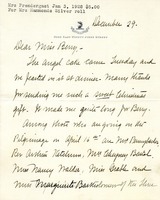 Letter to Mrs. George Francklyn Lawrence from Martha Berry thanking her for the donation to the schools. 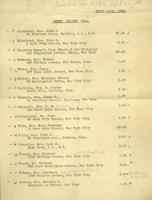 Money collected for the "Silver Roll"
This is a list of the money collected for the "Silver Roll" separated in two lists, check and cash form. 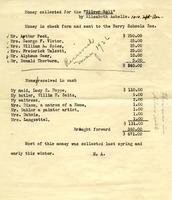 Donors include Achelis's maid, butler, and waitress.